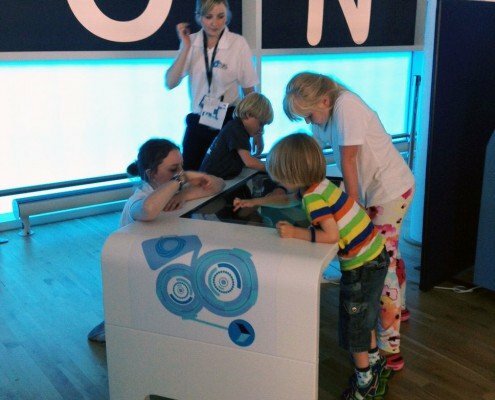 2 x Promultis Multitouch Cell Imaging Technology Tables were purchased for the new Sky Zone area at Birmingham Airport. The Sky Zone is an area furnished with modern interactive games and activities, including 2 touch screen tables, interactive floor projection, a gazing station and music light beams. Aimed at children between the ages of 2 to 10 years but great fun for all the family. Children and families loved the whole area. The Interactive Tables were used constantly by children 7 days a week and over an 8 week period over 25,000 children used the table. The Service from the Promultis Team has been excellent and were always available if we needed any help or advice. The whole project has been a huge success and the help and guidance with regards to both the technology and the software was hugely beneficial.